Entrepreneur and founder of the award-winning non-profit organization Claire's Place Foundation, which provides support to families living with Cystic Fibrosis. She has gone on to become an advocate for others suffering from the disease she has had since birth. She grew up loving to perform and landed her first role in the Music Man at 4 years old. She founded her own company at 13. She starred in the CW series My Last Days, which features real people with life-threatening illnesses. She was born in Austin, Texas with Cystic Fibrosis and spent roughly 1/3 of her life in the hospital. 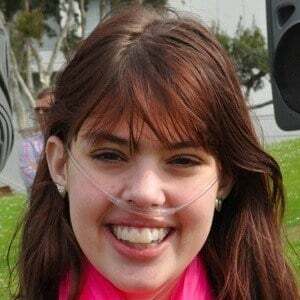 She had upwards of 30 surgeries; she died from a massive stroke following one of her transplant surgeries. She has a younger sister named Ellie. She appeared in the doc-series My Last Days, which was created by actor Justin Baldoni.